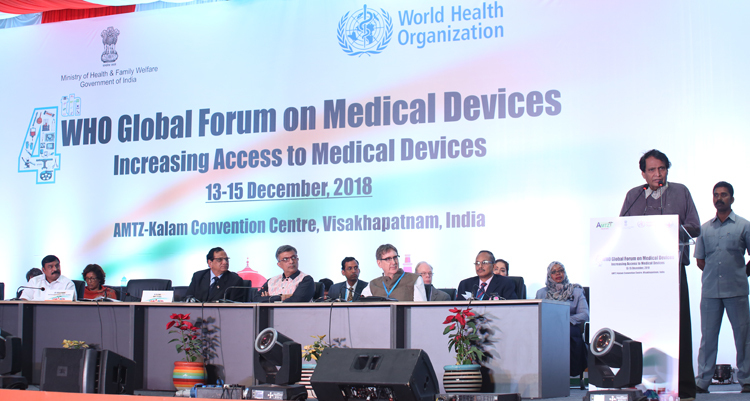 Vizag hosted the fourth WHO Global Forum on Medical Devices. It was instructive that the first time this conference came to India and AP MedTech zone was proud to host the event. It took enormous calibre and strategy to apply for this and host this successfully at Vishakhapatnam in Andhra MedTech Zone, AMTZ, India’s first and world’s most comprehensive medical technology park from December 13-15, 2018. The medical devices’ industry is a 30000 crore industry and touches all our lives and is highly import dependant. By the latest count World Health Organisation had approved registration applications of 1049 delegates from 90 countries. The delegates included, representatives from country governments, Ministries of Health, United Nations and inter-governmental institutions like the WHO, other UN bodies, bilateral donors like GIZ (of Germany) and USAid etc, researchers and academia and NGOs with affiliations with the WHO. Medical device industry was well represented in full force. A number of key dignitaries attended the forum and placed their plenary speech before the audience of 1200 delegates. Chief Minister, Chandrababu Naidu, who did the grand dedication of AMTZ to India and the world. He also invited the WHO and Global Forum organisers to use AMTZ for the forum every year. He shared the critical importance of medical devices and implants and considering India has a 90 per cent import dependency, setting up in-house manufacturing capacity is crucial to make medical devices accessible. It is an important but under-recognised aspect of global health and universal health access and AP government is committed to address that, not just for AP and India but the entire world, especially citizens of low and middle income countries. Naidu also inaugurated: Bio-Valley Incubation Council (incubation centre for hybrid med tech applications), Medi-Valley Incubation Council (incubation centre for med tech equipment), Indian Bio-Medical Skills Council (skill building for the bio-medical sector to promote employment and manufacturing) and Kalam Institute of Health Technology (does comprehensive mapping and curation of health technologies in India bridging the gap areas, it also helps in transforming successful innovations and technologies for market adaptation). Other key dignitaries who graced the occasion were: Union Minister of Commerce and Civil Aviation, Suresh Prabhu, Union Minister of State-Ministry of Health and Family Welfare, Ashwini Choubey, Minister of Health Medical and Family Welfare of Andhra Pradesh Farooq Ali, Vishakhapatnam MLA Vishnu Kumar Raju and Puducherry Health Minister, Malladi Krishna Rao. Prabhu expressed the need for enabling an ecosystem to help evolve this industry of medical devices in India and he looks forward to achieve this through AMTZ. Prabhu inaugurated National Medical Devices Promotion Council, Centre for Medical Equipment Procurement with Global eMarket and Centre for Patents for Biomedical Equipment. In his keynote address he also spoke about our intrinsic connect with medical devices, as we live longer and need devices to support mobility and quality of life. From amongst the key bureaucracy, the senior officials who attended the forum were: Dr VK Paul, Member NITI Ayog, Preeti Sudan, IAS, Secretary-Health-Government of India, RK Vats, IAS, Additional Secretary-Health-Government of India, Arun Singhal, IAS, Additional Secretary-MoHFW of Government of India, Dr Mandeep Bhandari-Joint Secretary-MoHFW, Dr Eswara Reddy-Drug Controller of India, Dr VG Somani-Joint Drug Controller, Rajiv Agarwal, IAS, Joint Secretary-Department of Industrial Promotions and key leaders of Department of Biotechnology, Department of Science and Technology and National Pharmaceuticals Pricing Authority including Shubhra Singh, IAS, Chairperson-NPPA. From WHO, Dr Tedros Adhanom, Director General and Dr Soumya Swaminathan, Deputy Director General, addressed the forum via audio-visual message. Dr Suzanne Hill, Head of Essential Medicine division and Dr Henk Bekedem, WHO representative to India attended the forum in person. From manufacturing and industry associations, there was a good representation. PHDCCI was represented by Vivel Seigell, CII South Africa by Jitin Bhatia and AIMED (Association of Indian Medical Device Industry), Rajiv Nath. The latter had clear expectations from the authorities: A 75 per cent trade margins cap on medical devices, increasing customs on imported medical devices to 20 per cent and better and transparent regulations. Built over a 270-acre land, AMTZ is a world-class facility in medical technology built with an intent to bring affordable health technology to the masses. AMTZ is the home for medical devices, equipment, testing and validation labs, prototyping, innovation, manufacturing regulatory along with policy support. All dignitaries applauded this event at Andhra medtech zone that would get India to global focus on medical technologies. Dr Poonam Malakondaiah, Special Chief Secretary (Health), Government of AP, said that the need of the hour is quality, affordability and accessibility, and with launch of AMTZ, she looks forward to address this need which has remained unaddressed in India for a long time. The Managing Director and CEO, Dr Jitendar Sharma shared the insights of making AMTZ, which garnered huge applause. A 270-acre med tech park’s phase-1 got completed in flat 342 days. Dr Jitendar Sharma announced that with the comprehensive infrastructure in place, this park is world’s most equipped park ahead of the western world. Every device goes through 18 tests and procedures before it is applied in real world and AMTZ is unique in giving all those 18 tests at the same address. He compared the 342 days of manufacturing journey to the energy and hope of a nation in construction. Considering the health requirements for a country like India, it is instructive what is possible and could be possible with the right leadership, mentoring and support, the 342 days’ construction of AMTZ and the hosting of WHO fourth Global Forum is precisely that. 1. Free diagnostics, making diagnostics accessible. 2. Oxygen supply options and systems for low and middle income countries. 3. Pricing administration, regulation and policies. 4. Fit-for-purpose policies and laws for regulation. 5. Enabling ecosystem for manufacturing in country. 6. Ethical issues around device donations. 7. Non-communicable diseases and priority devices. 8. How countries are preparing to adapt to the Essential Diagnostics. List recently released by WHO in the 71st World Health Assembly. 9. Nomenclatures and classifications which are standard across the world and the necessity. 11. Priority and essential medical devices by facility. Regulation was a major conversation point, especially in light of the ICIJ global investigations, #ImplantFiles. While American manufacturers thought the expose was alarmist, Indian manufacturers, acknowledged the expose’ and said it is a “Wake-Up Call”. More, better and up-to-date legislations were called by many countries across regions and continents. Innovation and scale-up was a major deliberation topic and scale-up challenges came under sharp focus. Market access for new innovations was also a topic of concern and ways and means for the same. During the event period of the 4th Global Forum, 10 MoUs were signed adding up to $ 150 million worth investments.